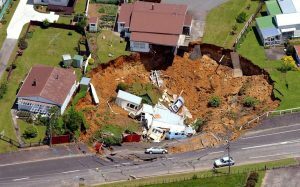 Sinkholes Can Cause Devastating Damage To Your Home – But does your home policy include sinkhole insurance? Several years ago the ground opened up and swallowed a house and damaged two neighboring homes. Ohio doesn’t have the sinkhole activity such as Florida or some other areas, but sinkholes definitely do happen here in Ohio. Sinkholes occur naturally when ground water erodes the limestone deposits. Sometimes a broken water main will cause a sinkhole to collapse in the city street or roadway. Is My Home Covered if it is Swallowed by a Sinkhole? I have had many people ask if sinkhole insurance is included in their home insurance policy. The Rough Answer: it depends. In order for there to be a claim for sinkhole insurance, there must be property damage for a claim to be possible. A sinkhole that opens up out in a field or even right next to your home without damaging any insured structures WILL NOT trigger coverage under your homeowners insurance. 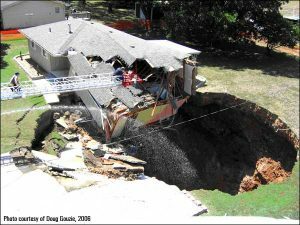 If the sinkhole causes any damages to your home or other structures, and your policy has a sinkhole endorsement, then coverage would be triggered under your homeowners insurance policy. However, the cost to fill the sinkhole is NOT covered. There is only coverage for the damaged property. In Ohio, most homeowners insurance base policies EXCLUDE sinkhole insurance. However, many companies allow you to add sinkhole insurance for an additional annual premium. There are some companies that do not offer an endorsement for sinkhole insurance. Are you covered in the event your home is swallowed by a sinkhole? Donahue-Stangle-Brown Insurance Agency is an independent insurance agency that represents numerous insurance companies and has served all of Ohio since 1948. With DSB Insurance you get quotes that are quick, easy and affordable while we compare prices with numerous insurance companies to give you be best coverage at the best price point. We offer a wide range of insurance products from auto insurance, home insurance, farm insurance, motorcycle insurance, RV Insurance, Boat Insurance, business insurance, business auto insurance, trucking, life insurance, disability and annuities. Please contact one of our professionals today at 740-998-5544 in Frankfort or 740-656-5119 in Chillicothe. You are also welcome to contact us via EMAIL.